If you have read any of the posts in Pin Loom Weaving, you may have noted my conviction that pin looms are the NEXT BIG THING, a craft that has been overlooked and undervalued for far too long and is poised for a resurgence. Pin looms were very much present at HGA's 2016 Convergence in the vendor's booths, in the workshops and in the fashion show. Marcella Edmund of Marcellaedmund.com has forwarded the pin loom field particularly in the area of woven garments. Two of her pin loom woven jackets, each featuring crochet or knit joins and embellishments, were a highlight of the the "Moving Forward" Fashion Show. Handwoven on pin loom, sewing, crochet. 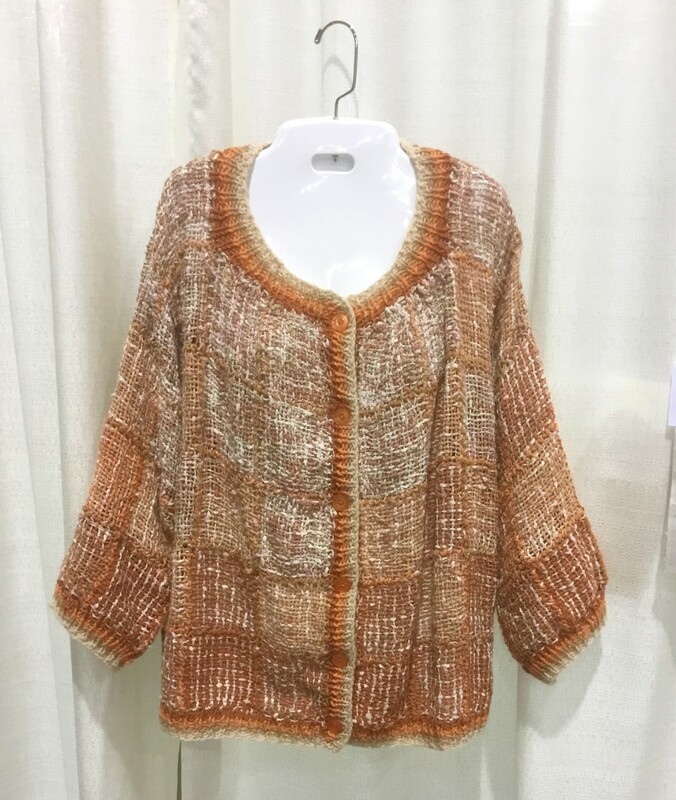 This is an original pattern using variegated thick and thin cotton yarn and wool sport weight yarn. I got to see this item up close and it looked gorgeous and very comfy. Handwoven on pin looms, with knitting and sewing. This is an original pattern using hand-dyed, handspun New Zealand wool. 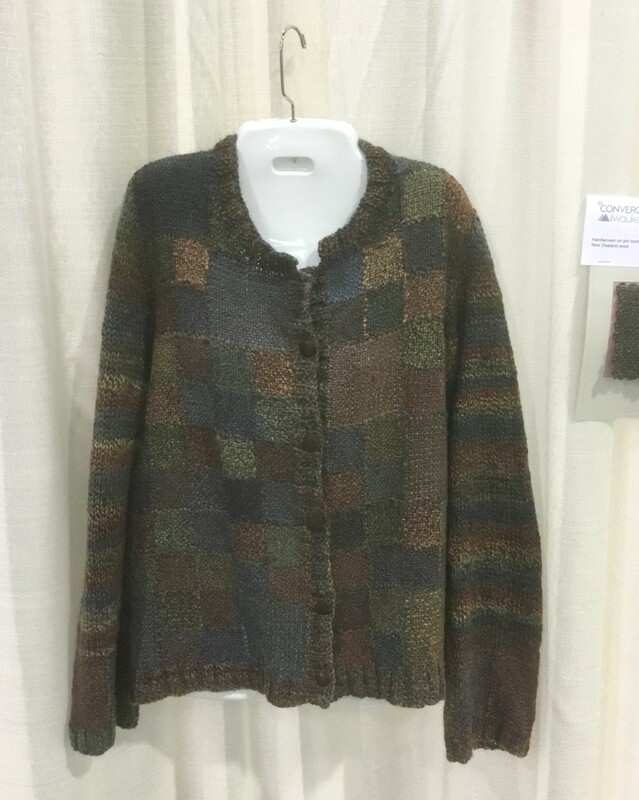 Notice that in this Mosaic Jacket, the body is made of woven squares while the sleeves are knitted. What a great combination! 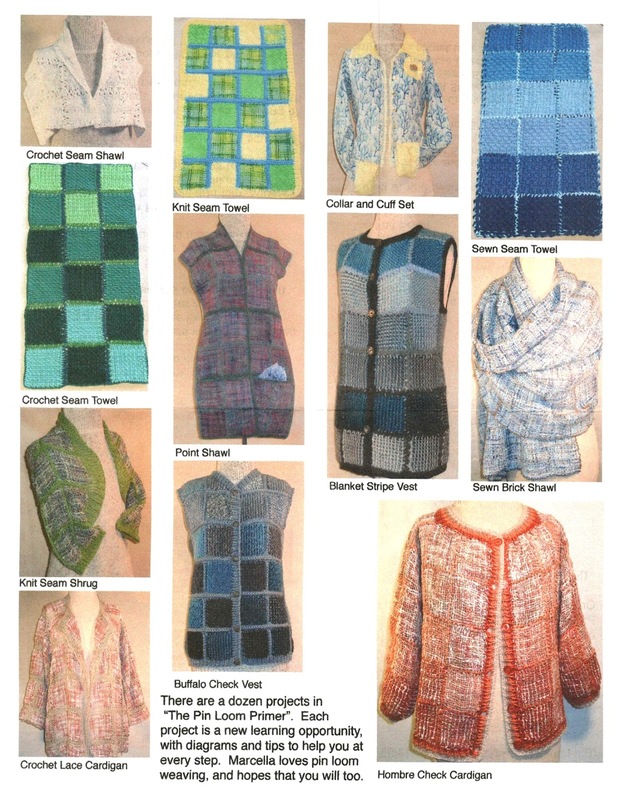 Marcella has built a library of clothing patterns that use both pin looms and either crochet or knitting to complete her garment. Interested in seeing more of Marcella's fabulous work? Check out Marcella Edmund's new publication, The Pin Loom Primer at Marcellaedmund.com She notes that this is a book about the different ways to weave and join squares. Familiar methods like crochet, sewing and knitting can all be used to join squares. Marcella offers a dozen projects, each a new learning opportunity with diagrams and tips to help you at every step. Check it out!